“Who are they? Who are these people who come to work here every day? What are they about? Why can’t we communicate with them? Why won’t they listen? Why won’t they just do what they’re told to do?” – the words of countless frustrated managers. Getting through to workers to influence their behavior, attitudes, and work habits is one of the most frustrating aspects of organizational management. How can senior executives, supervisors, and managers generate enough loyalty, motivation, and focus to move the organization forward each day despite rumors, uncertainty, “failed opportunities,” abrupt shifts in direction, obvious mistakes in decision making, and the daily sense that there really is no one in charge, no plan, or no strategy in place to meet future contingencies. The greatest continuing area of weakness in management practice is the human dimension. In good times or bad, there seems to be little real understanding of the relationships between managers, among employees, and interactions between the two. When there are problems, everyone acknowledges that the cause often is “a communications breakdown.” So now what? Enter the management communications strategist whose objective is to rethink, refocus, and then restructure the goals and objectives of this critical part of effective organizational management. The strategist might use these steps. The analysis begins by challenging some of the more closely held assumptions that appear to underlie modern employee communications theory. Employee communications is a staff function owned collaborative (or combatively) by public relations and human resources. Message uniformity and consistency are key ingredients to effective delivery and reception. The manager’s role is to run the business. Just tell the story right and don’t molly coddle employees. Redefine who comes to work each day based on actual behavior. Look for useful, insightful ways of drawing management’s attention to how it can achieve success by productively reassessing the nature of the human forces it has at its disposal and by looking at the business from a more employee-driven perspective. 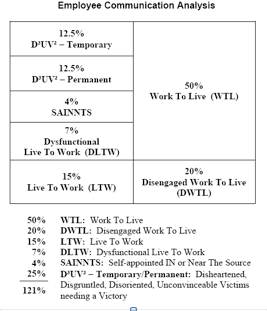 Those who Work To Live (WTL), 50%. Those who are Disengaged, but still Work To Live (DWTL), 20%. Those who Live To Work (LTW), 15%. Those who are Dysfunctional, but still Live to Work (DLTW), 7%. Self-Appointed IN or Near the Source (SAINNTS), 4%. The Disheartened, Disgruntled, Disoriented, Unconvinceable Victims needing a Victory over something (D³UV²s), 25%. Yes, yes, yes – those of you who are mathematical eagles will recognize that there may be a mathematical anomaly here, but remember that this is a strategic exercise. Our analysis of these categories will resolve this apparent discrepancy. Those who work to live comprise the largest portion – often half or more – of the workforce. These are the folks who genuinely make the organization successful. That’s because no matter what, they come to work on time; no matter what, they get it done; no matter what, they pretty much follow directions; no matter what, they will do what is asked of them – provided they can understand it. And they go home on time. They ask for very little in return. Don’t ask them to join company parties; don’t ask them to stand up and cheer; don’t ask them for great outbursts of loyalty; don’t ask for or mandate their involvement. When such opportunities arise, some of these employees may take part, but it will be on their terms, at their discretion, and in their own time. For these individual’s life begins outside the plant gate at quitting time. Work is their mechanism for having a life. That’s why it’s hard for management to appreciate these employees’ true motivations. Actually, they have only one – to go home on time, to get back to their real lives. These employees have personal or work-related problems so devastating that they are unable to function effectively. But, they show up on time every day and are surprised that no one has noticed their problems or kicked them out the door. Undoubtedly, those who are reading this analysis are among those who live to work – the folks who come early, stay late, and work to move the organization forward. LTWs are on the program, work hard to understand what the boss and management are looking for, and try to make it happen every day of the week. LTWs often resent anyone who goes home on time. LTWs are the forces of tomorrow in the organization. The DLTWs also come early and stay late. But their goal is to prevent or stop the WTLs from accomplishing anything meaningful. That’s because the DWTLs love today just the way it is. DWTLs especially want yesterday to stay just the way it was. DWTLs resent progress. DWTLs are the forces of yesterday, and they are very powerful. Usually a group no larger than 4% of the entire organization, often just a handful of knowledgeable people, working independently, who have appointed themselves the official interpreters for what the bosses do and what they mean. SAINNTS come in all sizes and shapes, and from all parts of the business. Perhaps as high as 25% of the workforce, these people bring powerful, negative energy to every situation. They assure the failure of most positive ideas and concepts put forward by management or by others trying to be helpful. New ideas or concepts are put to death with question after question: “When we tried this a couple years ago, it didn’t work; why are we trying it now?” “That’s not our style.” “It will never work here – why would employees buy it; our investors don’t like this kind of thing; the boss will never go for it.” “It’s not a very smart way to go.” “It won’t work in our culture.” “I’ll work against it.” D³UV²s (Doves) sometimes seem publicly positive but usually are relentlessly negative in private. Even though my ratios add up to 121% of the employee base, this analysis works because the D³UV²s’ victim driven negativity is at least twice as powerful, per person, at stopping or choking off progress as any positive concept could ever be. The D³UV²s are committed to getting nothing done and to seeing to it that no one else gets anything done either. D³UV²s question or challenge continuously. The value of this new perspective is how it helps us better understand why organizations have so much trouble getting things done. Each employee group has a limited ability to hear what management is saying. In good times, each functional group has a hearing efficiency of only 1:3. They get every third word. Even those who work to live fail to hear every message correctly the first time. This is why management’s relentless quest for efficiency and effectiveness is always off the mark and why demands to get it right on the first day are nearly impossible to achieve. Even lifesaving messages have to be repeated. When trouble is in the air, when change is on the horizon or coming into an organization, hearing efficiency is reduced to about every fifth or seventh word. Change creates fear, uncertainty, and doubt. When these are present, the listening efficiency can drop to 1:12 or worse. People who feel like victims don’t hear the facts. They can be moved only by appeals to their emotional state. This is why unconvinceables remain unconvinceables, why the disaffected remain apart, and the disillusioned will not be reclaimed. Their ability to hear facts or useful information is blocked by their internal monologue and their constant public questioning. Am I doing something that is important or relevant to something that’s meaningful? Am I making a difference? This is the group management wants to keep comfortable, peaceful, and healed. It’s these people who make the business run. They make ideas work. When management withholds information or simply doesn’t communicate, the WTLs become uncomfortable and begin to worry. The place they go for information is to the D³UV²s, rather than management. The D³UV²s generally have only one major constituency, the WTLs. When periods of uncertainty arise, if management is slow in answering the questions, the D³UV²s will combine with the WTLs. That means that up to three-quarters of the employee base is in turmoil and not ready to move forward in positive ways. These are optimal conditions for organizing activity, high turnover, increases in workplace accidents, violence, and quality issues. It is management’s fault. Surveying employees to determine if they “like” where they work is not a useful measure. Even during change, employees honestly say that they like where they work. That’s because employees have learned how useless surveys are. Liking or not liking the work may or may not have anything to do with whether or not anything useful gets done, because employees have learned to game the survey process. POSTULATE #3: Real Time Communication Can Overcome Lack of Facts and a Poor Strategy. Functional employees require very little information to stay focused on their jobs, but they need positively, useful, candid information promptly. They need answers to the questions. Increasingly we’re recommending, for example, that even in good times company management meetings be held in real-time using teleconferences at least once a month. When problems occur we increase the frequency to two-to-four times per month. Modern technology allows hundreds, sometimes thousands, of people to attend these telemeetings. Just being included is a form of acknowledgement and recognition, which is so important to WTL employees at every level. Hearing useful information from the boss, in real time, just as everyone else hears it, is a powerful tool for focus and clarification of goals. Real-time communication is the best way to control and disempower the D³UV²s. D³UV²s need delay and denial, negativity and emotional responses to keep up the confusion, fear, and uncertainty they cause. POSTULATE #4: The Only Effective Local Conduit for Communication With Employees Is Through a Source the Employees Respect and Recognize – Their Supervisor. 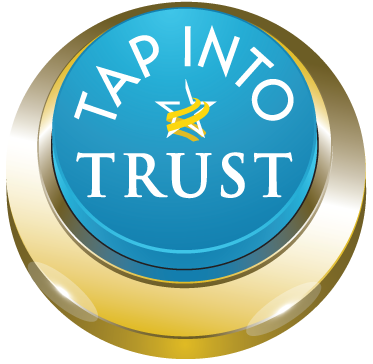 We reconfirm a well recognized but still poorly executed axiom: the immediate supervisor is the workers’ information source of choice – the most trusted, the most important and most powerful communication resource for individual employees – whether those employees are functional or dysfunctional. The public relations practitioner’s knowledge of the entire environment of the organization should drive the coaching, teaching, and development of supervisory communication skills. And, it may be useful to consider installing two functional supervisors within each working group in the organization – one who shares how the work is to be done and the other who both helps workers understand what’s going on in the business and collects information and worker questions to make sure that there is adequate feedback from within the organization so that questions are answered promptly. Strive to master the human dimension. Anticipate the unintended consequences of strategic action. Copyright © 2015, James E. Lukaszewski. All rights reserved. For more information on this subject, contact the author by e-mail at jel@e911.com or explore his Web site at www.e911.com.